Having sight problems such as short-sightedness, needn’t stop you from enjoying scuba diving. 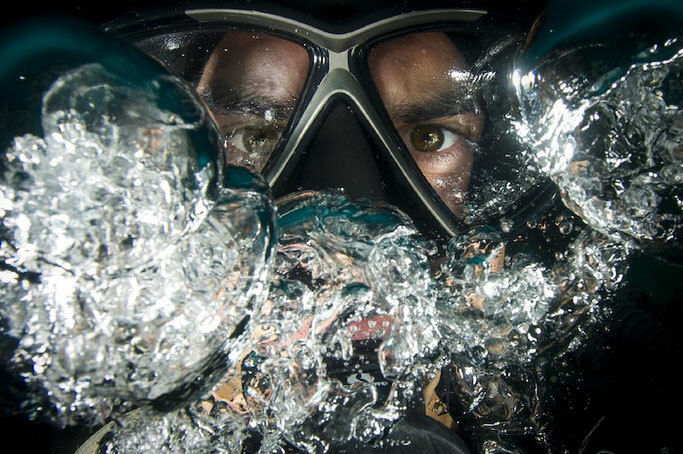 We recommend first to consider investing in a diving mask that has prescriptions lenses. Manufacturers such as TUSA can provide prescription lenses for scuba diving, however, the limited amount of lens strengths means your prescription may not be available. 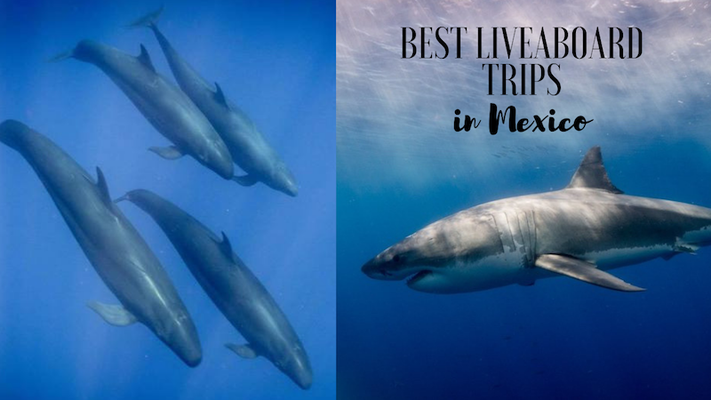 Prescription masks are also considerably more expensive and not everyone will want to invest in one at the beginning of their diving journey. Contact lenses, therefore, are a great alternative, but there a few things to consider when wearing contact lenses during scuba diving. Soft contact lenses are the most common type of lenses worn, however, there are some contact lenses wearers who prefer hard/ridged gas permeable lenses. Soft lenses are a much better option for diving. Gas permeable lenses are susceptible to suction as atmospheric pressure increases. This can cause pain and discomfort to your eye. Being permeable, they also allow gases to pass through to the eye, meaning that nitrogen bubbles can easily form between the lens and the eye, causing blurry vision. Contact lenses can also cater to those with more paticular prescriptions such as toric and multifocal lenses. 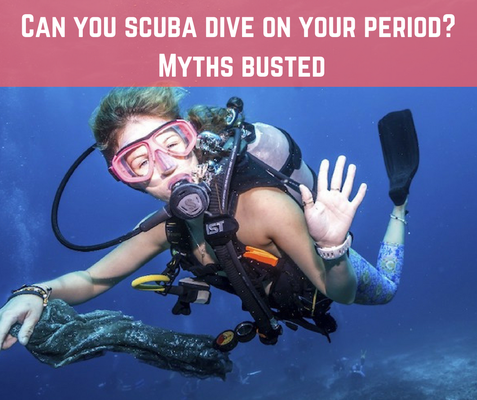 Water, particularly untreated water, can cause infections and as contact lenses create a layer where particles and microbes can sit, it is important to take particular care when wearing lenses when diving as your mask is likely to flood. For this reason, it is highly advisable that you remove and replace your contact lenses at the soonest possible time once you’ve exited the water. When removing your mask whilst practicing flooding, clearing and retrieval skills, make sure to close your eyes to avoid your contact lenses floating out. It will also ease discomfort and irritation from salt water and reduce the risk of infection. In the rare event that you lose partial or complete vision, your buddy or guide will be better equipped to help you if they know you cannot see, so make sure to let them know and prepare between you a procedure in the event of loss of visibility. 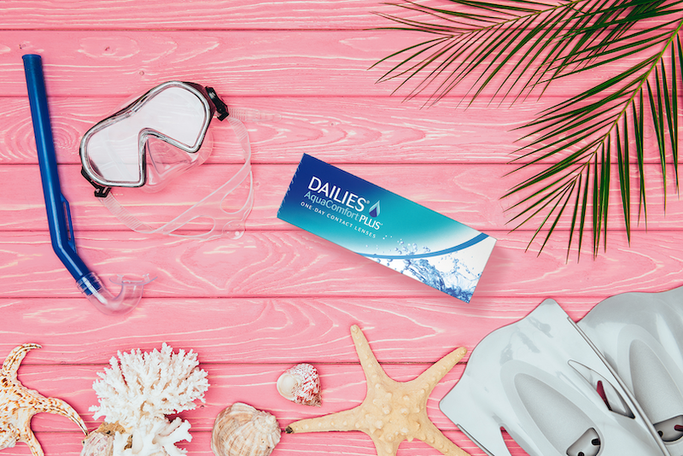 Make sure to drink plenty of water and consider using eye drops before and after your dive to add some well needed moisture and hydration to your eyes. Eye drops are usually available in small 10ml bottles or mini vials that will slip easily into you diving bag. Now that you can see clearly, it's highly important that you dispose of your contact lenses correctly. As scuba divers, we’re more than aware of the danger that plastics are causing to our oceans an environment overall. While contact lenses may make up a small percentage of that waste, it is still important that you dispose of your contact lenses properly and do not add to the problem. Approximately 45 million people in the United States alone wear contact lenses, this amounts to at least 13 billion lenses worn each year. If one were to calculate contact lens use for the rest of the world, the total amount would be significantly more. Many contact lenses wearers throw their lenses down the sink or into the toilet which is the wrong way to dispose of them, they should be thrown in the bin. If not, the lenses ultimately end up in water treatment plants, become part of sewerage sludge and flow into the oceans. As contact lenses are made from non-degradable materials, they break apart, but do not break down, contributing to micro plastic which smaller fish and planktons easily mistake for food. Some contact lens manufacturers are attempting to solve the problem by recycling. US manufacturer Bausch & Lomb offers a recycling program for contact lenses wearers. They are, however, the only contact lens manufacturer that currently offers this service, which is currently only available to US residents. The innovative program recycles the lenses, blister packs and packaging, and Bausch & Lomb accept waste products from all other contact lens manufacturers, making them a leader in the market. So there you have it, jump in and enjoy your dive. 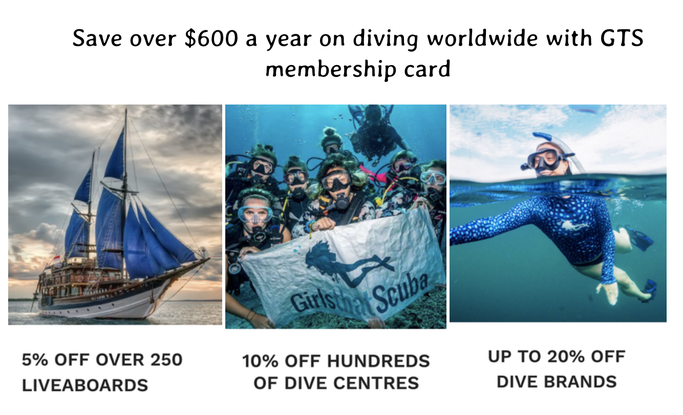 Get 10% off your first purchase of contact lenses at FeelGoodContacts.com by joining our Girls That Scuba membership club and save hundreds on diving, liveaboards and scuba brands too!